A population of Americans known as the “dual eligibles” is among the nation’s most needy and expensive groups. They are 9.6 million elderly and disabled low-income Americans who are dually enrolled in both Medicare and Medicaid. For most of the 50 year history of the two programs, the “duals” fell between the cracks, getting poorly coordinated or no care. Twelve years ago, with federal support, Massachusetts’ Medicaid program, called MassHealth, started a “Senior Care Options” (SCO) program for coordinated/managed care for duals over age 65. The new Kaiser report describes the evolution and structure of “One Care,” the nation’s first significant experiment to provide coordinated/managed care to the disabled duals under age 65, about 70 percent of whom have significant behavioral health issues, along with many other medical needs. The demonstration launched in October 2013 for a three year initial period. Three Massachusetts managed care organizations are enrolling and taking care of an estimated 17,763 enrollees out of 110,000 eligible individuals. The three participating plans are Commonwealth Care Alliance, Fallon Community Health Plan, and Tufts Health Unify. 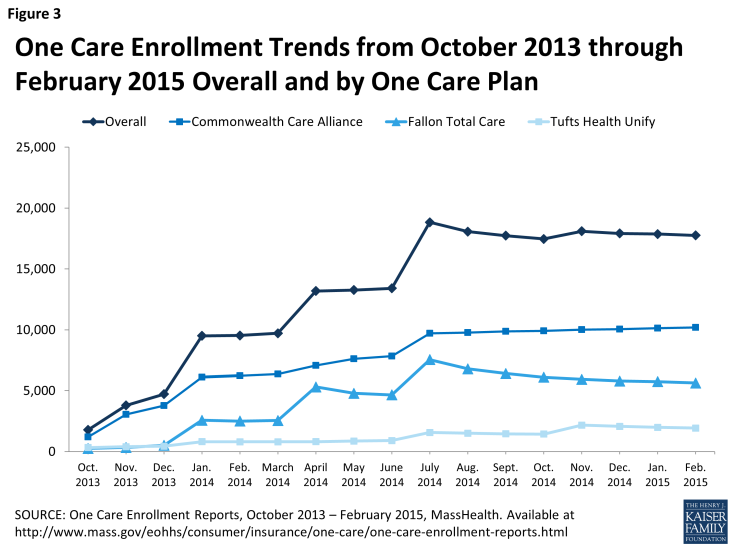 The chart below shows enrollment stats through February 2015. The three plans are paid on a capitated global payment rate, described in helpful detail in the report. They are deliberately given significant financial flexibility to use the funds to keep enrollees as healthy as possible so they can function independently and well in their communities. Other plans are also joining similar demonstrations in other states — Massachusetts is unique in the presence of state-based non-profit providers with the sophistication and resources to take on this substantially risky gamble. The Kaiser report highlights the major efforts by MassHealth to make this program as transparent and open as possible. Many Massachusetts community and advocacy stakeholders have been intimately involved in this process from the beginning. The launch of this program is a significant accomplishment and tribute to the Administration of Gov. Deval Patrick who prioritized the launch of this program. Our new Governor, Charlie Baker, along with his Health & Human Services Secretary Marylou Sudders, are keenly aware of the importance and stakes of this program. The Kaiser report is a helpful introduction to this program and how it came to be. The report is candid that data is not yet available to measure and assess how well the program is working. I will use Health Stew to provide updates and reports on the program as time goes on. In the meantime, let’s take some pride that Massachusetts is the first out of the box on confronting one of the most important challenges facing our health care system in the ACA era. One Care is not about saving money — it’s about using state and federal dollars wisely and well to give enrollees the quality of care and service they deserve. It deserves close watching and I wish it well.